A BIG FALL ISSUE WITH LOTS OF SURPRISES! PM 77 brings you the glories, the adventure, the excitement that is a safari through the darkest jungles that Marx ever put together, and their first excursion into the Jungle theme, "Jungle Jim"! This issue is shaped around this spectacular introduction with the enormous effort Marx put into this set, with highly detailed animals in characteristic jungle poses, the deeply interesting set of new natives, and the cream dream plastic character figures and Hunters. The mysterious jungle compound makes its first appearance and so do a unique accessory group that brings much excitement and animation to the scene -- that spiked trap is a wonder to behold. This set is brought to you through the efforts of some very fine collectors, instigated by Glenn Ridenour, Rick Eber, Craig Remington, Francis turner, and Super Bowl champ Tom Glassic -- a whole top tier of collecting access to not one but three mint boxed sets so you can see exactly what came in these sets, monkeys and all -- and what the likely variations are when you get lucky enough to score one for yourself! I am always so proud to talk about these efforts --- after they are done! Getting there though is a labor of pure giddy love! Also on board...... is the Marx HO Jungle, a charming comparison to the large set; plus a maker whose popularity is clearly growing, Multiple Products -- MPC. From them we have a gorgeous and very rare Jungle Wilderness Store Display -- colorfully ensconced in a big display with a covering transparent window. Wow! Plus more Jungle rarities and goodies to fill our pages with their colorful vintage deliciousness for our varied (and increasingly ravenous) tastes. Next up are three show reports, because this is the season for the good stuff to be brought out onto tables neatly arranged for the hunt in locations as varied as Wheeling, San Antonio and Gettysburg itself. You’ll enjoy these colorful and descriptions of the hunt. Plus we have a small piece on Insiders Tips for the OTS Show and what surprises it holds in store for each of us as attendees! Plus our four-year long effort to commemorate the Sesquicentennial of the American Civil War, our feature this time introduces you to Mr. Roy Ahlgren, artist for the awesome Marx Civil War Centennial gun sets, brought to you this time by collector George Kroll, PLUS updates on Annie Oakley, and more First Wave Collectors from our exciting portrayal of the Early Days of Collecting last issue. And did I mention our very favorite star of stage, screen and now the press Wyatt Earp Hugh O’Brien has a new book out? Hugh O’Brien, or What's Left of Him -- Read all about it right here in our news section. Then you will be whisked off to the Circus – the rare Disney on Parade Miniature Circus in fantastical colors and character, photographed in detail by our newest author, authored by DeAnn Jelinek, Eng.D., PMP CSM. You’ve probably never seen this one complete before, with all its tough smaller parts and box, and a new way to see those exotic animals. 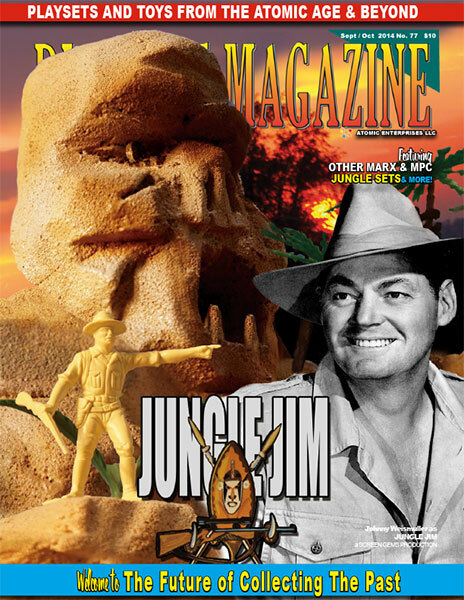 But you’ll not escape the jungle that easy -- this issue as we also bring you the rare, rare, rare original Jungle Jim store display for the #3404. What? Never heard of that one before? That’s because this never-before seen set caught us completely off guard as well, courtesy the great Marx Museum and its curator, Francis Turner. Breathlessly emerging from your journey, you’ll explore pages of ads by the world’s finest vintage dealers and advertisers, those fine folks who make your hunt so easy! Like browsing a remote off-the continent bazaars of the unusual, the amazing and exotic, you just select your favorites and dial ‘em up, it’s yours! That’s increasingly important as we approach the haloed season of Christmas, coming right around the corner for all of us to enjoy (particularly the cooler weather!) So till then, we hope you enjoy this big Fall issue, and we’ll see you at the OTS toy soldier show!.